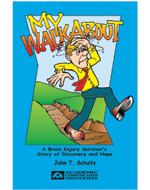 The life of John Schultz changed suddenly when an artery broke in his brain. He awoke from a coma with a damaged brain and a paralyzed body. With help from a speech-language pathologist, occupational therapist, and other professionals, John, an electrical engineer, was able to "reboot" and to re-program the "scrambled software" in his brain. This inspirational book tells his story and is MUST READING for parents and their families. It can also be used to increase student's awareness of the challenges caused by brain injury.